My Avensis 08 sedan remote key works like this: Everything works normally in two days. After that Battery dies. Tried to switch batteries four times. Tried to put precision cleaner for electronics. Tried to took off rubber buttons. Why the Battery dies after two days? Our you certain the Battery is being drained or is it simply the act of removing and refitting a Battery that gets it working again ? The sprung contact under the Battery is know to be troublesome. The fix is to remove it carefully (pry it out) and to retention it. Refitting it back is the reverse of removal. It can also be helpful to clean the pads on the circuit board that this connector contacts using isopropyl alcohol or similar. 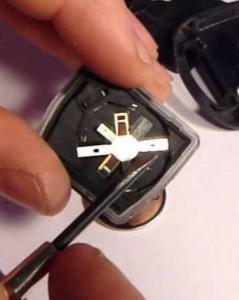 This image is from the web but shows the spring contact. In this version the spring can be removed completely by carefully prising it upward. The contacts can then be gently bent to tension them more. There are a couple of contacts that touch the circuit board and the other contact the Battery. The contacts that touch the board are at the 12:00 and 19:00 positions. My plan B would be to now test that Battery and make sure it really has been discharged by the remote. Ideally that means checking the voltage under load which is tricky. If you find leaving it out for a while and then refitting the same Battery back causes it to work again then something else is going on. If however the Battery has genuinely been flattened by the remote then its not diy repairable I'm afraid, well unless it was something like the case pressing on one of the buttons and it was discharging it that way by it transmitting all the time. A bit of a long-shot here! I have accidentally bought counterfeit (branded) button cells a few years back in a similar size to this, they didn't last as long as the genuine item, but their life was not as terrible as your ones. But, before you condemn the remote, have you tried a different brand or supplier of Battery? These lithium batteries have a long shelf-life, so age shouldn't be the problem. A bit of a long-shot here! I have accidentally bought counterfeit (branded) button cells a few years back in a similar size to this, they didn't last as long as the genuine item, but their life was not as terrible as your ones. But, before you condemn the remote, have you tried a different brand or supplier of battery? So based on all that has been done and tested so far it would appear that the remote is discharging the Battery itself. Thats pretty much game over on a diy level. Disclaimer... what follows next is something I would try but be aware this may wreck what functionality the remote still has. Has moisture or any contamination entered the remote at all? It is possible to wash electronic circuitry like this to clean the circuit board. You would need to remove the board completely from the case and using a little detergent and a soft brush/water gently wash the board. Having done that pat it dry with paper towel tryng to wick as much mosture up from the component side and around the switches. Place on a hot radiator or in the sun for several hours before trying it. Temperatures up 50C wont do any harm at all. The board just clips into place. A little gentle prising with a tiny jewellers screwdriver should release it. I took case to local locksmith. They inform me when its ready. If i order new key from ebay, how can I know frequency? Use in Finland. Blade is TOY47. Thats for sure. Case was marked 89071-05010. What about transponder chip? Do you keep the remote chip/key close to the car? I take it you know if they are close to each other the key fob and car communicate to each other all the time, it's best to store the key fob as far away from the car as you physically can, just a thought. If stored too close to each other the drain on the key fob Battery is much, much quicker, worth a try. Very little you can do from a diy perspective. Powering the board from an external 3 volt supply and monitoring the current draw would be next. When not actively transmitting the current draw should be essentially zero, certainly less than a couple of microamps. Maybe I will order a new ones from eBay. How can I know the correct specs to my car? Is this correct? TOY47 434mhz 4D70? I wouldn't like to say on whether it would be suitable or not. The immobilser chip (thats the unpowered one embeded in the plastic of the key) would need programming to allow it to talk to the cars ECU and allow it to start. The remote locking chip would also need programming to be able to talk to and unlock the doors. A lot of if's and but's there to me.